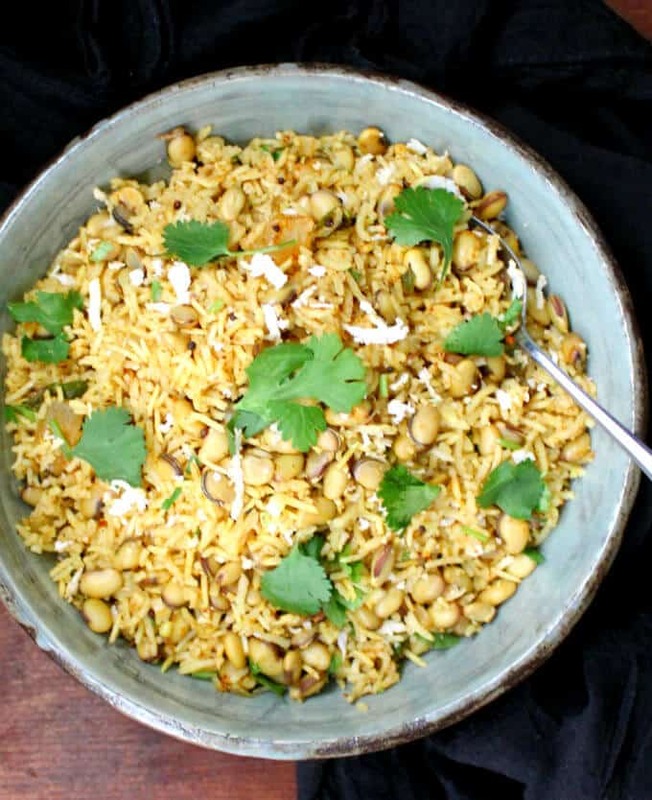 This Hyacinth Beans Masala Rice Pilaf is the stuff of mom’s cooking in Indian homes. It’s a traditional dish that’s as tasty as it is nutritious and easy to make. 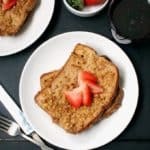 A soy-free, nut-free, gluten-free and vegan recipe. As the new year rolled in, I mentioned I wanted to cook more this year with legumes I don’t use as often as I should in my cooking. 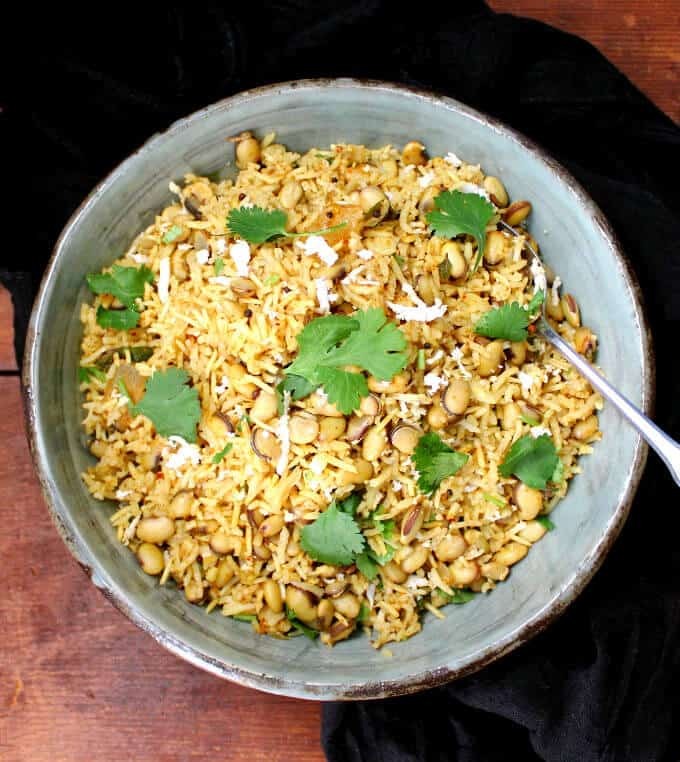 One of the first recipes I put on my list to share with you is this delicious Hyacinth Beans Masala Rice Pilaf that is made often in homes in Maharashtra, my mom’s — and my own — home state. A hyacinth bean, called vaal in India, is a rather compact-looking beige bean with a black and white eye, and I don’t ever recall seeing one in supermarkets here. Some online recipes confuse these beans for lima beans or fava beans, which are in fact very different beans. Hyacinth beans are easily available at Indian grocery stores here in the United States, and if you don’t have one near you, you could certainly use quick-cooking beans like lima in your recipe. 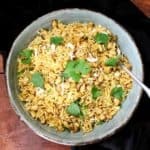 I first came upon a version of this rice pilaf years ago on one of my favorite spots to find Maharashtrian recipes, the One Hot Stove blog written by Nupur. 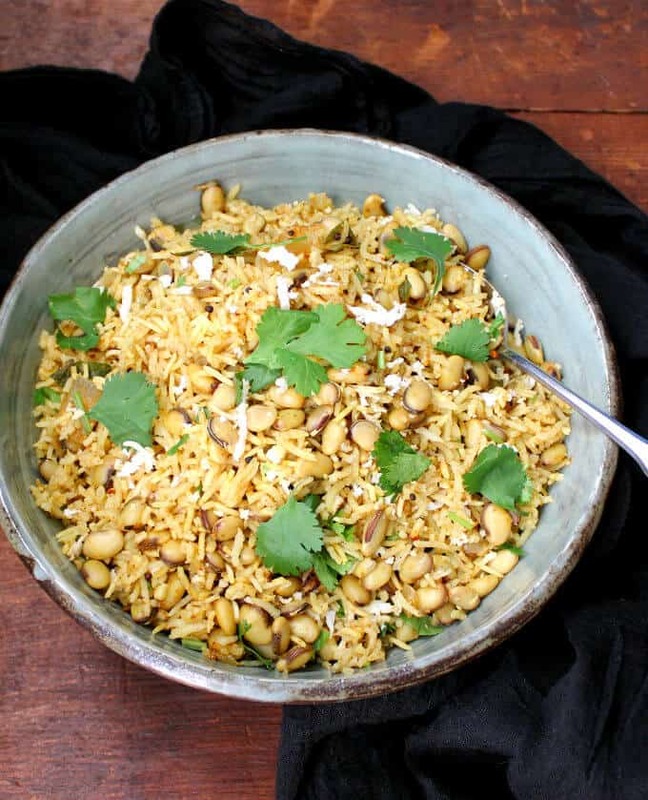 Called Dalimbay Bhat in Marathi, this pilaf appears homely and simple, but don’t underestimate it because it is incredibly delicious. Over the years I’ve tweaked this recipe only slightly for practical reasons. Nupur’s original recipe requires you to sprout and peel the beans, which produces a more delicate flavor. 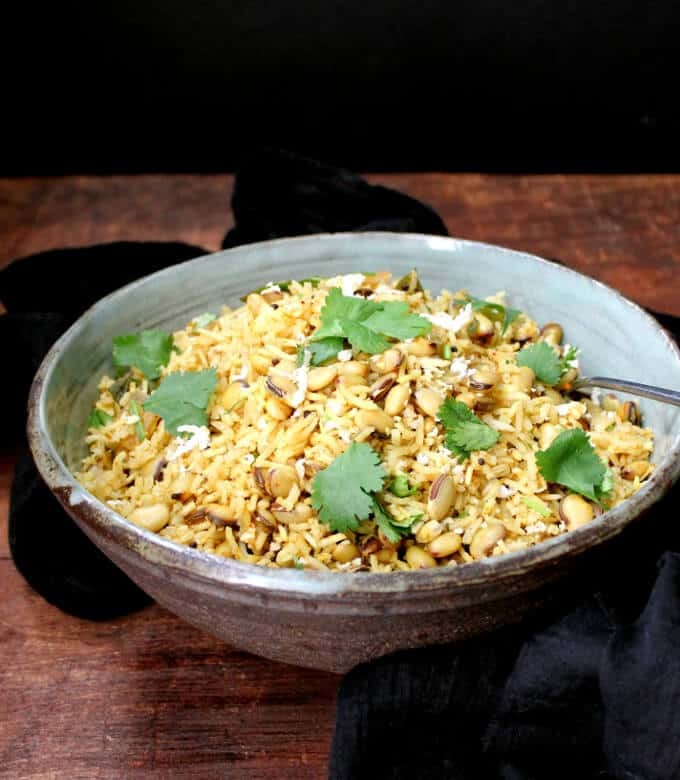 I usually do this when I cook this pilaf in summer, and it’s an effort well worth the time. But with the freezing temps we’ve had of late, sprouting has become a rather time-consuming — and sometimes impossible — thing to do. So instead I opt for just soaking the beans overnight and then giving them a quick boil for about 15 minutes before using them in the pilaf. This tenderizes them just enough so they can continue cooking with the rice in the pilaf without falling apart. I don’t want to oversell you on hyacinth beans if you haven’t already eaten them, but there’s no good reason not to eat them, and many reasons why you should. 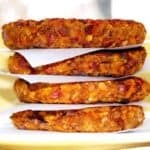 Like all beans, they are fiber and protein stars, and they are nutty and delicious. They are also high in iron and calcium, both good reasons to incorporate them into any diet, but especially a vegan one. At the Indian grocer’s, they go by the name “vaal” beans. Look for them. You’ll be happy you did. 1 1/2 cups hyacinth beans, also called vaal beans. You can sub with lima beans. Soak these overnight, wash, and place in a saucepan with enough water to cover the bean by an inch. Bring to a boil, cover, and cook on low heat for 10-15 minutes until tender but not mushy. 1 1/2 tbsp goda masala (garam masala will work at a pinch). Look in recipe notes below for link to both goda masala or garam masala recipes, or you can buy them online. Heat the oil in a large pot. Add the cumin and mustard seeds and when the mustard seeds sputter, add the onions and curry leaves. Saute until the onions start to brown, then add the goda masala, cayenne, turmeric, and coriander. Stir to mix. Add the rice and stir-fry for a couple of minutes until the grains of rice turn opaque. Add the drained hyacinth beans along with three cups of water and salt to taste. Bring to a boil, cover with a tight lid, and lower the heat to a simmer. Cook 15 minutes and let the rice stand another 10 minutes without uncovering. Open the lid, add the coconut and cilantro, and mix with a fork, fluffing the rice gently. 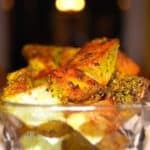 Serve hot with poppadum and an Indian pickle. 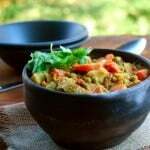 Find recipes for Goda Masala and Garam Masala here. 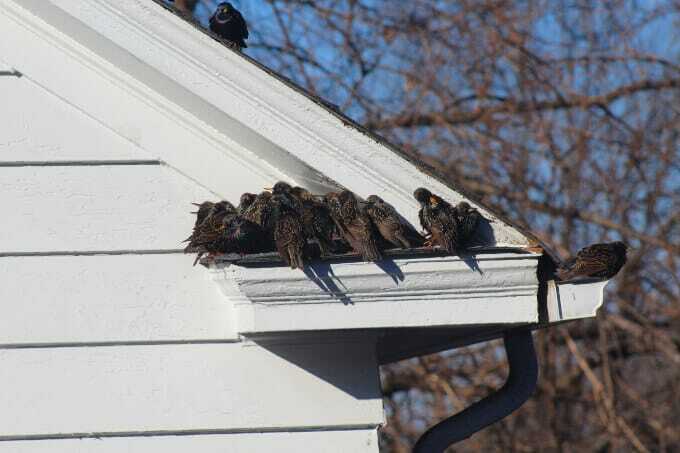 Dozens of birds (starlings?) 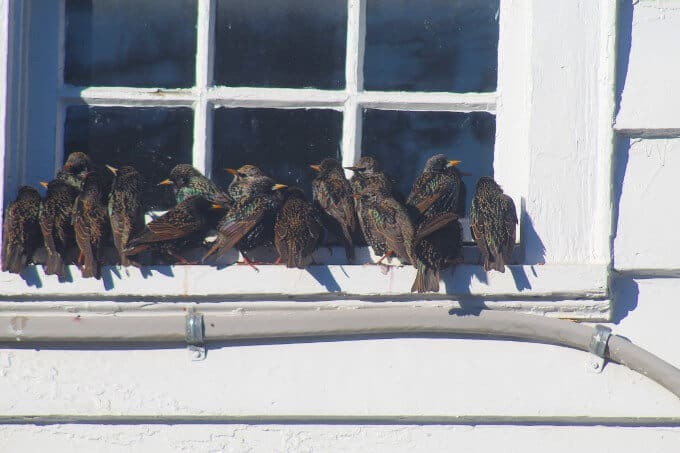 huddled together to say warm along my neighbor’s windows and eaves on one of our coldest days last week, when temperatures dipped several degrees below freezing point and stayed there for a prolonged period. Birds are warm-blooded, like us, and although their bodies do adapt to some extent to face the cold weather, they need your help, especially when the weather is so harsh. Be sure to feed birds in wintertime — I used to be negligent about putting birdseed out in winter until I read articles that say birds with access to feeders survive the cold weather at a higher rate than birds without access to feeders. If possible, also provide them with water (heated bird baths are available if you live in an area where temps drop below freezing often). I bought vaal in the Indian grocery store because I thought they were small lima beans. My indian friend said they were not. 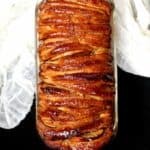 I found some recipes and tried cooking them. I soaked them over night, but they never got soft even after soaking all night. They seem to have a very tough skin. 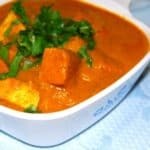 Can I use vaal dal for this recipe? On a different note, I seem to be off your mailing list…. I didn’t receive this posting. Could you please check. It may also be a problem with my email. Hi Ruth, if you use vaal dal, soak it overnight but don’t precook it, because it will become very mushy when cooked with the rice. I am surprised the vaal you got was so tough– it is usually very brittle and boils up easily, not unlike lima beans. I will add your email to the mailing list. Sorry you got dropped– that’s really strange. Update: I checked and it looks like you’re already signed up. Please check if your spam filter is catching it. Thanks. Thanks for the info about vaal dal…. Could you please resend this posting to me… to see if I get it. It is beginning to look like an email problem. 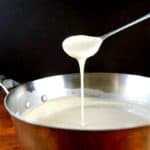 Hey Ruth, I can’t send you a posting because it’s automated, but hopefully you got the recipe I posted yesterday. If not, let me know and I’ll look into this a bit more. Hyacinth beans are new to me, but as a fellow legume lover, I am intrigued. I am certainly putting this on my shopping list. 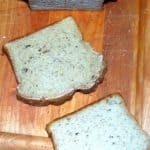 I love how simple and flavorful this recipe is. I cannot find these beans anywhere around where I live, I might try subbing them out for another bean. 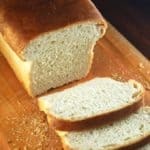 I haven’t been on this website long but I have been reading through the recipes and a lot take ingredients that are not found in my area. There is no Indian grocery store within 50 miles of where I live. 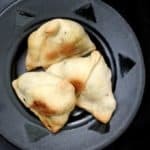 It is a shame I cannot make a lot of these beautiful recipes as I really love Indian food! I would buy most online but the prices are too high for me right now. Hi Lynn, you can be use Lima beans in this recipe.